•	Amazon Prime members will be able to get two free Audible audiobooks through their Amazon membership portal. •	New customers to the service will get one free audiobook title by signing up for their 30 Day Free Trial. •	The Audible App (for Android and iOS devices) is a 100% free download and necessary for these audiobooks to work. It’s available through the Google Play and iTunes mobile app stores. •	Every audiobook purchased on the Audible service can be used with any of the mobile devices that you’ve logged into your Audible account on. •	Multiple membership plans are available, including discount plans for Students, Teachers, and others. 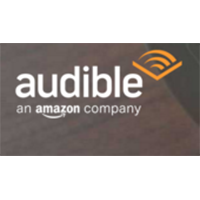 Audible is a Amazon company that specializes in audiobooks and digital media. You will be able to browse through a selection of different novels that they have available on the website. You will have to pay for a subscription that gives you access to different titles that they have available. If you want to try the service out for 30 days you can do so entirely for free and be able to get one audiobook during the trial. Otherwise you can get 1 free book a month with a regular subscription and pay for any additional novels that you might be interested in listening to. For most up to date offers check out Audible UK on Facebook and Twitter or contact Audible UK Support for any questions.